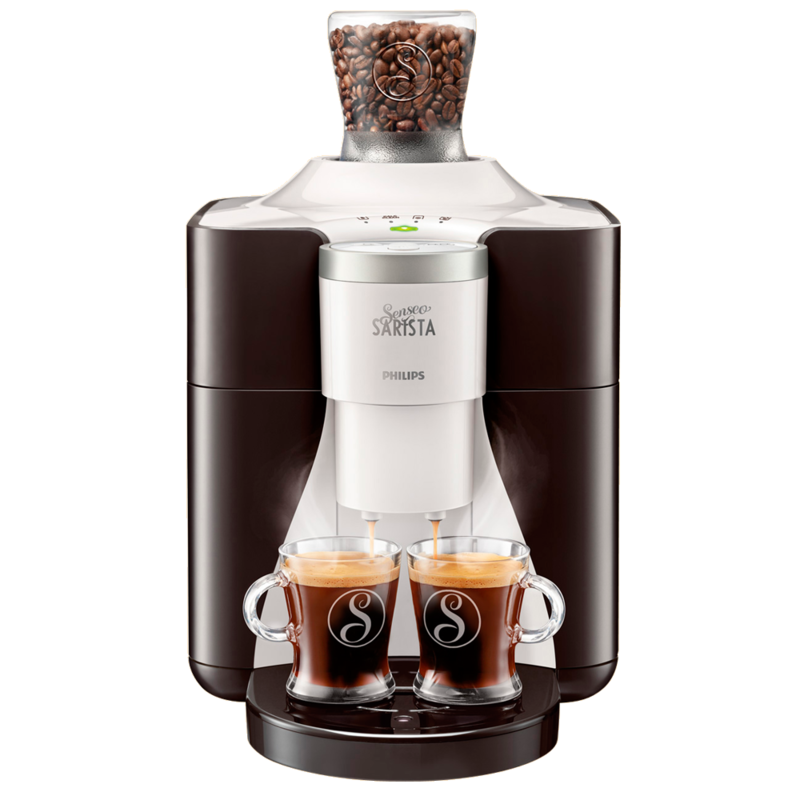 Typical coffee machines have two user-accessible compartments: one for water and one for coffee beans. Pouring water into the bean compartment kills most machines, the repairs cost a fortune. this machine is permanently connected to the water pipe (like a washing machine) and so there's no water compartment, only a bean compartment. There's also a brief hand-crafted manual next to the machine explaining that the machine is connected to water, no water needs to be poured anywhere. Still some people try to pour water into the bean compartment. 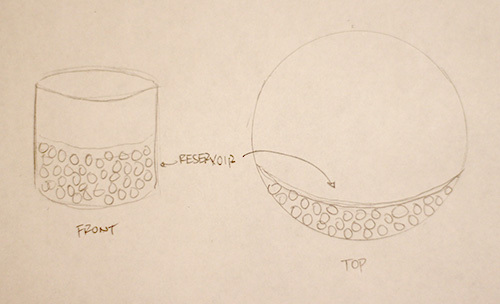 How can the design be further improved to prevent users from pouring water into the bean compartment? You need the bean container or filling mechanism to communicate in its physical presence alone, that it will not hold water. Additionally, emphazising what is expected, coffee beans, in form of an icon might help. 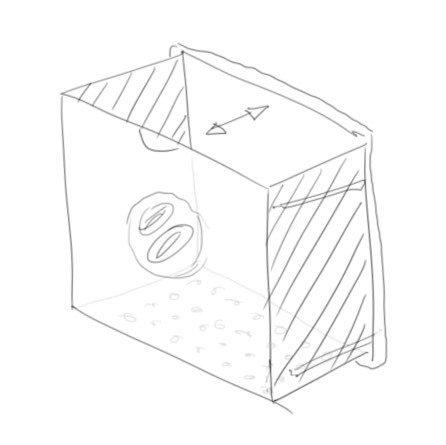 This is just a crude sketch to visually show what I mean by "physically" communicating that the water does not go in here. Devise the coffee bean filling latch in a way that has visible holes that will obviously let water through, but are small enough to hold coffee beans. What this approach does is not only solve your communication problem, but at the same time this will eliminate the actual breaking of the machine by pouring in water, because the water will simply not run into the slot (my sketch is crude and I am no product designer nor engineer, but you get the point - make the right angles and curves and whatnot and it's simultaneously a physical impossibility to get the water in). P.S. : If you get rich implementing this I will insist on receiving a free coffee machine even though I prefer tea! As you observe, connecting the machine to a water pipe removes the need to add water, but the need to add coffee leaves the user with one place to put water. So what we're looking for is a way to remove the need to add coffee; the user will then have nowhere to put the water. The solution: Mains piped coffee beans. Make the user open a drawer to place the beans inside. Once closed, the drawer simply opens into the bean container normally. Water almost never goes into a drawer. How about only one opening which leads the water into the water compartment and beans into the bean compartment? 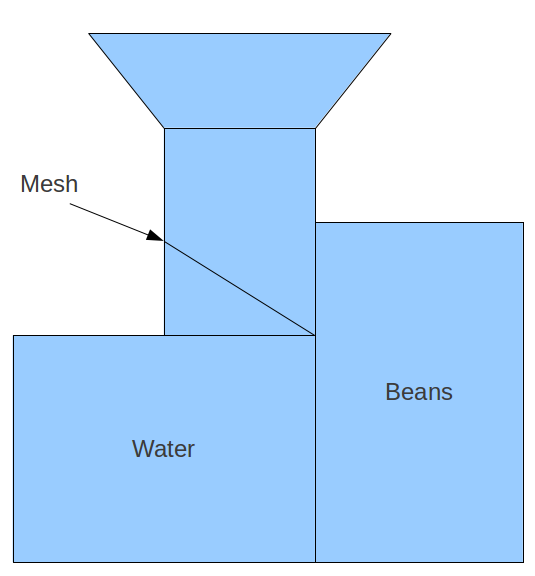 The mesh would let the water flow through and the beans pour to the side. One would imediately ask the question Are Users Stupid? which often isn't the case. The coffee container above the machine could very well be a place to pour water. Why? It's on top of the machine and since gravity still is around water would go into the machine if we used it that way. Second, it's transparent. 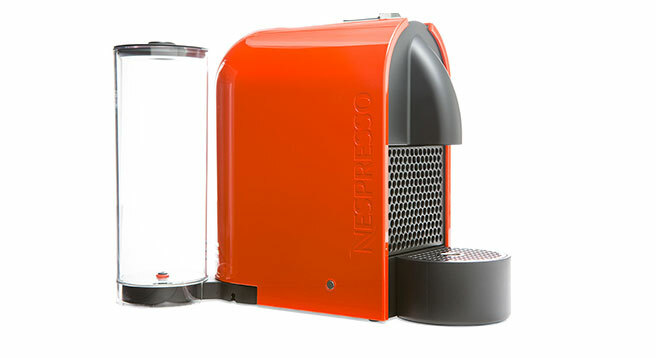 Nespresso coffee machines use transparent water tank - so there's a chance of confusion here. So how do we store coffee beans in the cupboard? Not in a transparent container, but more often in a tin jar, or in an aluminium jar. Why don't we mimic that instead? 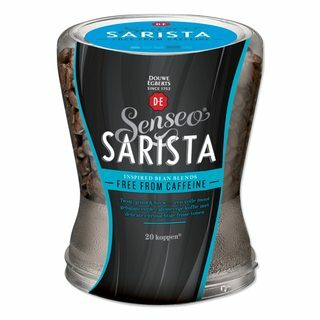 Also we could label it with big red text saying NO Water and to further emphasize our meaning place images of coffee beans on the jar to help our users. 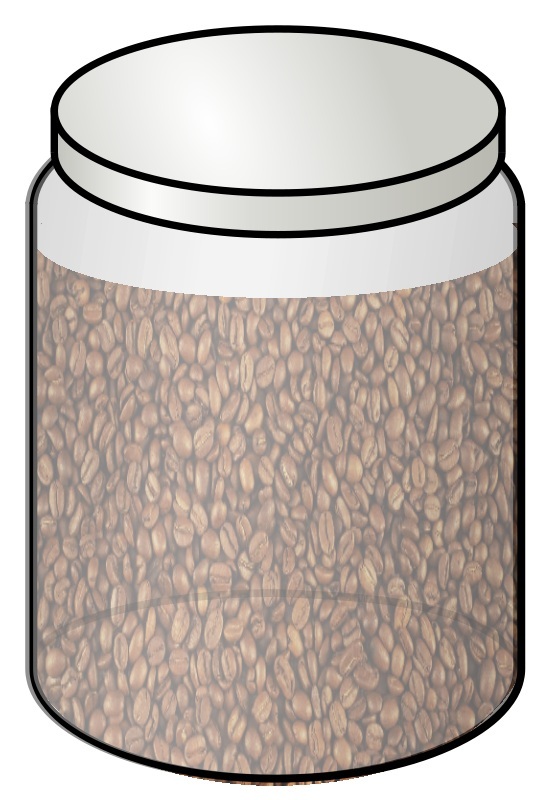 Finally, we could place our coffee bean jar at the bottom of the machine, with tiny holes in the bottom of the jar making the water that is accidentally poured in the jar escape the machine. We'll end up with a little water on the table, but the machine still works if the user makes an error. Conclusion: There are no bulletproof systems that never fail. But we can help users along the way and minimize the posability of damage through visual cues, text, placement and looks. More importantly, make sure the system doesn't get damaged when something unexpected happens. First, don't have an open hopper (even with a lid) on top of the machine into which anything can be poured. Second, have the beans go into a container that must be removed from the device in order to fill it. The container could be lifted off the top, or slid out from the side. It could even be like a drawer that does not fully detach. Third, the container should have holes in it that are large enough that it could not possibly hold water, but small enough not to let the beans pass through. 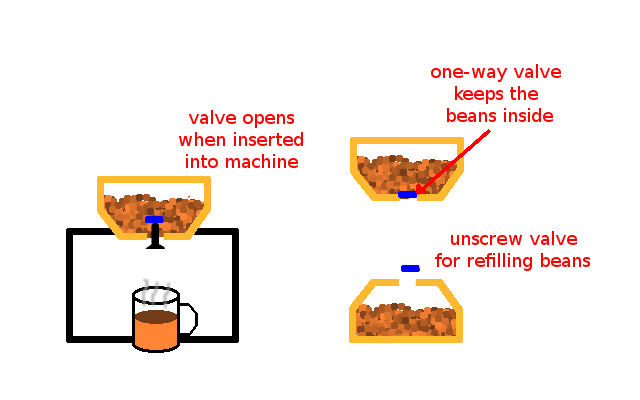 Fourth, to address the issue of air circulation affecting the freshness of the beans: when the bean container is attached/inserted back into the machine, the water pass-through holes should end up sealed simply by their positioning relative to the part of the machine where the container is attached/inserted. It seems to me that the biggest problem is that users pour water in the bean hopper because they can't think of where else to pour it and get confused. So, why don't you put two, identical plastic or aluminum cylinders on the top of the machine. Then, emblazon one with a large brown bean, and one with a large blue drop of water. This sends the message that "water goes here, beans go here, not the other way around", and, because they're right next to each other and are clearly labeled, there's no confusion. Also, because they are right on top of the machine, the hoppers and the symbology printed on them become a prominent part of the design, and users are less likely to confuse the two due to inexperience with the machine. Heck, they'll know where to put beans and water after looking at the picture on the box. Personally the biggest problem I have with coffee machines is you have to go hunting for one or the other - the location of, say, the water reservoir is quite obvious but the location of the bean hopper is not, or the other way around. Why not make both of them quite obvious and well marked? One idea is to use an upside down cartridge with a one-way valve. To refill the coffee beans, the user would remove the cartridge, unscrew the valve cap, and fill the beans into the cartridge. The one-way valve should have obvious holes so that it can hold coffee beans, but will not hold water or pre-ground beans. If the user, through some silly error, pours water into the cartridge, the valve would leak the water when they flip the cartridge upside down, hinting them that they're doing something wrong. 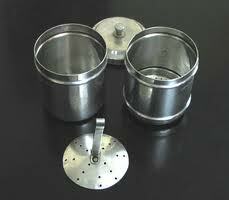 The machine would have some simple mechanism to open the one-way valve to dispense the beans. Additional hints could be added by using a coffee-colored plastic for cartridge, decorating the cartridge with image of beans, and some written text would also help remind them what the cartridge is for. Water could go in the through a water pipe. Could it be an option to make the water connection plainly visible? At the moment, it seems to be hidden behind the machine. That looks nice and clean of course, but what if you would make it very, very obvious that there is already water connected to the machine by moving the connection to the mains to a visible place, and perhaps by showing a transparent pipe running through the machine that is filled with the water to which it is connected? Don't do anything, let it break and leave it a few weeks before fixing it. During this time, when ever anybody asks why it's not working, just explain that some idiot has broken the machine, by "adding water where the beans go, don't they know it is plumbed in and gets water by itself." Word will soon get around, and everyone will tell new employee's how to fill it. Never allow the two compartments to be empty. If there are always some beans, and some water in the two sections, then it’s less likely that a mistake would be made. This has obvious downsides: you’d be pretty frustrated that your coffee machine would refuse to use the last of your bean, but I imagine there’s a range where it’d be OK. There are lots of suggestion for a fake container with water, but that seems to be impractical given that this machine only has one native receptacle. It's bound to look fake. You could take the existing plastic reservoir to a plastics store (e.g. TAP), and see if they can glue in a transparent sheet to hold a small amount of beans at the front face. The main intent is to make the coffee compartment appear full even if it's nearly empty, making it unlikely that someone will pour water directly in it. I have another idea. Instead of using a container, drawer or hopper to hold the coffee beans, how about using non-refillable containers of beans instead? Your company could sell the containers as a continuous source of revenue even after the machine has been sold. The coffee refills can be shaped and inserted in a way that obviously isn't suitable for water, like sliding them in from the side, perhaps positioned in such a way that the label is always visible so you can even see what kind of coffee is in there. Using containers that look like the picture below. Note how the container does not allow re-filling (at least not from the top), so pouring in water seems very illogical. 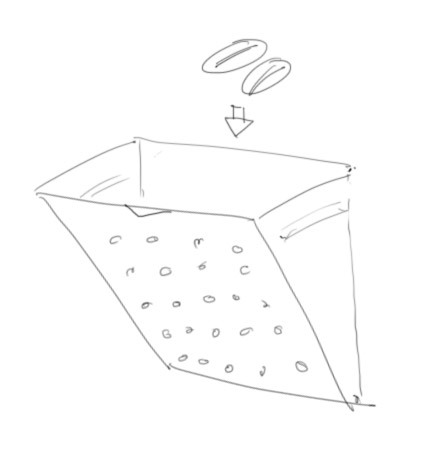 Instead of a compartment that takes beans, just use a regular filter basket taking coffee grounds. Have a separate grinder next to the machine, if necessary. It would take a real moron to pour water into a standalone grinder or into a filter basket. Bunn already makes machines exactly like this, that connect to the water line. If you don't need the fancy bean grinder built-in, it should solve your problem. A cheap IR sensor would work. If the sensor signals something present, open the flap and let the coffee beans drop into the container below for processing. If not, either there are no beans or there is water. In any case, the area where the beans should be placed would be removable so the user could pour out the water if a mistake was made, thus avoiding ruining the machine. My idea sounds expensive (and therefore impractical), but maybe it'll trigger an idea so I'll post it. If I place the beans so they must "travel up" to the coffee grinder/filter then there's no way water to get up there, since gravity will always make water go down. Say a crane or conveyor belt brings the beans to the grinder, and was angled/shaped in such a way that water could not travel up the belt. This belt would always grab from the bottom, to prevent "old bean pile up"
Instead of iconography or text information about the proper use of the compartment, I would suggest adding graphical representation of the beans that should be inside, as much as possible. Make it physically look like an industrial-level coffee maker. Use of high quality materials (instead of plastic), rivets, etc would make the coffee maker look like it doesn't belong in the user's home, therefore they'll approach the use of it differently. Have an LED water level indicator on the display. It always indicates the water is full. People don't like refilling water and the indicator will always make them feel confident they don't need to worry about it. Since there is a strong correlation with the color blue for water, have the color of the coffee bean container be brown. Don't keep large water vessels (pitchers, etc) nearby the machine if possible. Keep the extra coffee container very close to the machine and visible at all times. These are more user tips, but help nudge the user to refilling with coffee instead of water. The first two points are key. The user needs to be very well aware that this is not a coffee machine they are used to. Add a water sensor to the bean container and wire it up to a webcam so that pictures and video will be taken of the offending party. Make it known that if you break it you buy the next one and you will get caught and publicly shamed. Bonus points if the cost of the machine can be auto deducted in payroll. If pure usability is the goal I see a very simple and probably very cheap solution. Give the bean hopper a coffee bean print. This simple detail would instruct users that this is where beans go and therefore water would not go there. 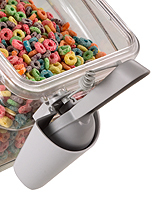 Leaving a slit in the print would allow users to tell how empty or full the hopper is. Don't have any opening to fill in beans or by mistake water, Get beans in sealed container, sealed with cardboard at the bottom, which the machine can penetrate. Another solution is to connect bean jar through a pipe to bigger source of beans similar to how water is sourced. The bean source is maintained by a dedicated person. Sounds like a simple label near the hopper ("Does not require water" and "Beans only") could be used. It is a little unusual to have a device such as those connected to the water main. Why would a user go to a book to read that you don't put water in it. It is a common gadget (granted its an exaggerated coffee maker), why would you need the instruction manual. 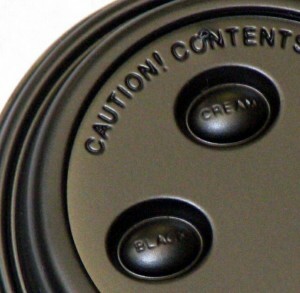 A sticker of a large coffee bean could be placed on the back of the cylinder, visible through the front, or the picture of a large coffee bean embossed in the plastic on the front (Like the Philips Senseo bean cups) Around the rim of the lid, the word 'BEANS' could be engraved in a lighter shade of grey. OR place a holster for the coffee bean scoop on the cylinder and then users will visually understand that whatever goes in must need to be scooped. When I train my dog, I had to work with rather than against his instincts. Your project here works against people's instincts because they visualize water and pouring water as part of the coffee process. My advice is to offer a place to pour water. Even if it is unnecessary, it will immediately clear up the problem. In the overflow grate there is an opportunity, for example. Could you add a funnel (the natural "Pour Here" sign) somewhere where adding water would improve the design? Additionally, I disagree with adding labels or words. Don Norman's Design of Everyday Things discusses this at length, but I'll summarize. People are smart enough to know how to use a door, so if they pull when they needed to push, it means the design is bad. To compensate for bad design, they add a sign to explain to people how to use a door. If at all possible, avoid treating your users this way. If the design is good enough then you won't need a sign/label. Not the answer you're looking for? Browse other questions tagged user-behavior physical or ask your own question. How can the user know that he can enter list of emails separated by commas? Should a user be prevented from making an invalid selection or denied with an error message after the fact? How to avoid people from using the coffee spoon into the sugar jar? How do users benefit from having a browsing history? How to discourage users from using a feature? How can I test a users decision to buy something? How can we be safe from hitting a glass wall that is hard to notice?